Finding first gear in the 1970 Triumph GT6+ was easy enough. Second was where the problem was. I wiggled it around in the housing, searching, searching. Was that second? Nope, still neutral. Wiggle, wiggle. Gave it gas, but no speed happened, just revs. Clutch back in. Wiggle, wiggle. Our speed continued to fall as I struggled. Behind us, other cars loomed as traffic caught up. Insultingly, most people on their way to wherever had no mercy or patience for a stumbling British sports car. Did they not recognize art when they saw it? I threw the shifter back into first and floored it. We sped away in a raspy, straight-six roar, and then I went back to trying to upshift. This was my first time driving a GT6, and the car was not going to make it easy for us. Besides wanting to drive something very pretty, there was something else I wanted to find out about the GT6—specifically the U.S.-spec second-generation GT6+. I’m no stranger to an old, British car’s reputation. I know they have a tendency to leak, rust and break down. But that seemed to say more about the owners than the cars themselves. Were these cars actually worth the trouble, or were they solely maintained by masochistic Anglophiles? Triumph started out this whole thing when it built the Spitfire in the early 1960s: A minute, two-seater convertible, named as a tribute to the famed World War II fighter aircraft used by the Royal Air Force. Though the car is technically at 2+2 coupe, a rear shelf in the back could be fitted with seats and, theoretically, children could ride there. They’d have to be some pretty small children, though. There were three generations of the GT6, and this GT6+ is the second one. Whereas the Spitfire was produced in mass quantities, the GT6 was not. Only 40,926 GT6s were ever made, according to Road & Track. And after you start subtracting cars from that figure thanks to factors like time, rust, decay and people turning them into race cars and crashing them, it’s instantly apparent that seeing a GT6 in such a nice condition today is a fairly rare thing indeed. In photos, the GT6+’s size is hard to gauge thanks to those classic sports car proportions. In person, though, it’s tiny. Even I thought it was tiny, and I have no business calling anything tiny. The roof barely comes up to my chest and if I needed to work on anything in the little engine compartment, I’d have to get myself a low stool. Or I could just sit on one of the front tires. It’s perfectly scaled for me. By the way, could that even be called an engine compartment? A compartment implies a closed-off space. Once you unlatch and push the clamshell hood forward, it’s just the engine wantonly sitting there. This is more like an engine area. And it’s perfect that way. You’d never lose a wrench or a bolt in that engine bay. And those are Mikuni motorcycle carburetors, if you’re curious. Inside, a wooden instrument cluster gives off warm tones. The owner also fitted it with Lotus Elise seats and re-trimmed everything in Paul Smith fabric, giving the cabin a very stylish feel. Flowing lines and circles shape the exterior, resulting in a wonderfully unfussy aesthetic that speaks plainly to 1960s automotive design. This car would not look out of place parked in the driveway of a mid-century modern, ranch-style house. Even though it’s nearly 50 years old, our Triumph is well-maintained, so it fired right up and settled into a healthy, lumpy idle. As any well-loved and well-preserved old car should. I showed up ready for a completely unassisted afternoon and that’s exactly what I got. Driving this car took some effort. Effort to push the clutch in. Effort to steer. Effort to brake. Even effort to lean the throttle. Shifting was by far the toughest part. First and third were agreeable gears. Even fourth was, too. But finding second remained the challenge. I rowed around furiously, trying to find the gate. It felt like pushing a stick around in a bucket of rocks. Finally, the lever clipped into the gate, a resounding thunk confirming my discovery. I let go of the clutch and gave it gas. A properly British straight-six roar filled the cabin. This Triumph was built during a time when there was no sound manipulation. Maybe they could muffle it a little bit, but the sound you heard was the sound you got. And my God, was it delicious. I’ve driven countless manual cars before, even ones that lacked just as many assistance systems, but this GT6+ goes above and beyond in making you very physically engaged in the activity of driving. Because there was so much more effort required to manipulate everything about it, the translation into forward movement truly felt like I was the one responsible for it. I was the one pushing it across the Earth when I prodded my foot into the gas pedal. I was the one really grasping at the road with the tires when I took a corner. Together, this plucky little Triumph and I were doing an activity. The car also had more lean to it than I expected. Its chassis and suspension weren’t so stiff and unbending that you’d rattle your teeth out; rather, the car almost felt like it would drop a shoulder when cornering. Sort of like when you’re on a motorcycle. This is an aftermarket Bell exhaust system. And as with all lightweight and lightly powered cars, you are never going faster than you think you are. But speed isn’t the point. You take up so little of the road, you are so agile and maneuverable that you feel like you can dart between raindrops until the end of time itself. I was acutely aware of when I started getting better at the GT6+. Shifts became smoother. Second was more easily located. Balance between the clutch and the throttle improved. And when I got out to give Ballaban his turn, he went through the exact same process. 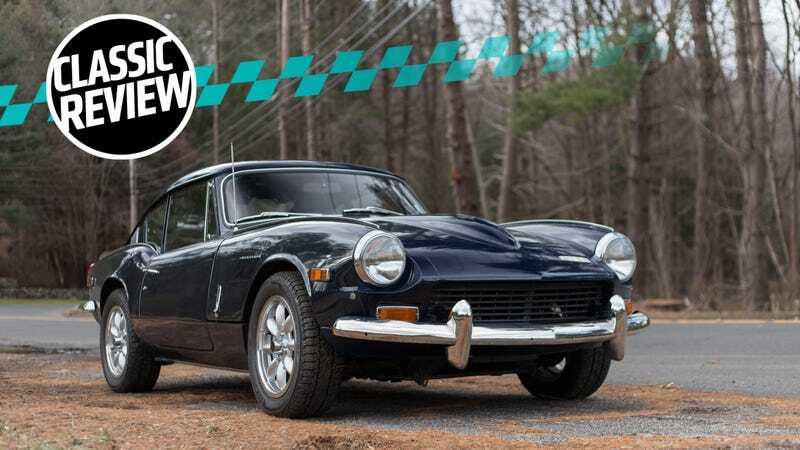 Most manual cars have some sort of learning curve, but this Triumph’s is quite steep. It’s such a reward at the end when you get it. The car’s here to teach you how it’s done, and you’ll learn, or else something’s going to grind in a real ugly way. And the most amazing thing is that, just 50 years ago, new drivers would learn to drive on cars like this! Can you imagine putting today’s average, American, teenaged new driver behind the wheel of one of these things? Most of them would quit on you in minutes and go back to Snapchat. You have to be realistic when you own an old, British car, though. One of the things you must accept is that there will be leaks. It’s not a matter of if, it’s when. And things will rust. The GT6+’s owner is extremely cool in that he drives his car year-round, but he’s also careful about not taking it out when it’s raining. I’ve heard that these things will simply melt if they even look at water. 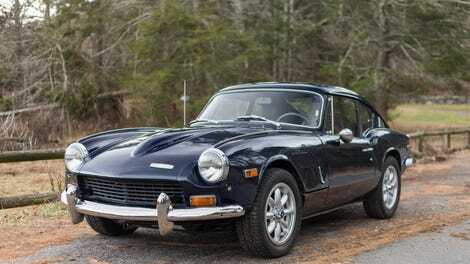 Cohabiting with a car like the Triumph, to me, seems very much like living with something that has its own free will. Driving is never a right, it’s never a guarantee. The car has its own agenda of what it wants to do day-to-day. If that happens to be driving, then you’re in luck. You will be treated to one of the most fun and pure driving experiences of your life. If it’s not in the mood? Well, you can go ahead and cancel those hotel reservations because you aren’t making it to the meet. It sounds agonizing and delightful and frustrating and amazing and infuriating and gratifying all at once. No wonder people do it.